On Tuesday January 5th, Walt Disney Studios Home Entertainment will release WINNIE THE POOH: A VALENTINE FOR YOU Special Edition on DVD! 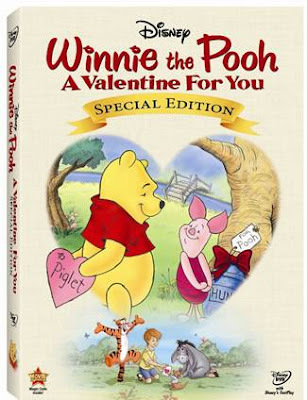 This Valentine themed animated collection features three Winnie the Pooh stories including a new-to-DVD adventure (“My Hero) a fun bonus feature (“Catch the Love Bug” game), Pooh-themed Valentines cards inside each DVD plus all features from the original. As a bonus, each special edition DVD includes Pooh-themed Valentine’s Day Cards! On January 5, Disney DVD will release the beloved and heartwarming classic, Winnie the Pooh: a Valentine for You Special Edition. This Valentine themed animated collection features three Winnie the Pooh stories including a new-to-DVD adventure (“My Hero) a fun bonus feature (“Catch the Love Bug” game), Pooh-themed Valentines cards insid each DVD plus all features from the original. In Un-Valentines Day, it's that warm and wonderful time when Pooh and his pals like to show how much they care. But Rabbit wants to cancel Valentine's Day because last year, he was up to his ears in the flood of cards that littered the Hundred Acre Wood. Reluctantly, everyone agrees -- until someone anonymously sends Pooh a pot of honey. Suddenly, the Valentine rush is again out of control, much to the delight of all -- including Rabbit. In A Valentine for You, Pooh, Piglet, Tigger, and Rabbit see Christopher Robin making a valentine for a girl and find he's been bitten by a "Smitten" and is lovesick. Worried that he'll no longer have time for them, and hoping a second bite from the love bug will cure him, they set out on a wild adventure to capture the Smitten. My Hero is a new-to-DVD adventure that shows the lesson of two friends truly helping each other. When Piglet saves Tigger’s life, Tigger decides to repay the favor by being Piglet’s servant. But Tigger’s new job causes Piglet more harm than good. When Tigger saves Piglet’s life, his obligation to be the servant is erased and all is back to normal. A Valentine For You reminds us that there's room in our hearts for both old and new friends! I get to give one lucky winner a copy of this DVD! Giveaway ends on Tues. Jan. 12th, 2010. *I do not receive either monetary or any other form of compensation. I love disney...This movie looks cute. I don't get into all the Pooh toys and stuff, but I love the movies and books. Love Pooh and Tigger too! Follow you on Twitter also! This looks like it would be an adorable movie! Would love to have it for my little nephew to see. Great giveaway! Thank you! My kids will love this! I am now a follower!! This looks like such a cute movie! The kids would love it! My three year old would love this. My kids love Winnie the Pooh! How Fun! I also voted for ya! So cute! Pooh is the best! Aww I would love a Winnie The Pooh dvd! Haven't watched in so long. Little Boy loves Winnie the Pooh! My new granddaughter would LOVE this in not to long. I love Pooh & friends! I follow your wonderful blog!!! I have your cute button too!! I love these types of kid movies. They are so wonderful! I hope I win! I'd love to win this for my 4yr. old granddaughter. The grandkids would love this. You're going to have a good collection for your future grandkids! Hope you're feeling better. Love you. My kids love Pooh! Would love to win! Oh my kids LOVE Winnie the Pooh!!! Count me in! Your button is already on my blog. I haven't seen this movie, but I bet it's cute! :) Winnie the Pooh shows are so gentle and nice... it's good to have those kind of movies around for little ones! Thanks for the chance to win Shauna!!! what a great way to beat the winter blahs,,thx for contest..
How cute! Valentines and Pooh...sign me up! I love winnie the pooh movies! This one looks fabulous! My kids love Winnie the Pooh! I have your button on my blog, too. Winnie the Pooh is such a loveable, huggable little bear. I would love to win this dvd for my little loveable, huggable daughter. Cute! I hope I win! This looks like a fun DVD! Thanks! I have your button up! This movie looks so cute!! Would love to win this for my kids! Fun Valentine DVD for the kids! My kids would sure be happy if I win this for them! Your blog design is soooo cute! :-) Love it! I'm following you on Twitter. Wasn't sure if I'm supposed to leave a main comment first. You can delete this if I'm not. :-) I noticed a lot of others are. My daughter would love this DVD! She's going through a Winnie the Pooh craze stage and I'm getting everything I can from the library, lol. This would be awesome to win! I just love Winnie The Pooh so much! Now we are starting a whole second generation of Pooh lovers at my house w/ my kiddos. I love Winnie the Pooh and this one looks so cute! I would love to win this for my little one and give it to him for Valentine's Day! I'm a Disney lover. Thanks for the possibility. Love Winnie the Pooh - thanks for the chance! I am following your blog. My 7 month old would love that!